The automotive industry has taken huge strides in recent years, leveraging the power of digital signage technology to boost operating efficiency, increase sales opportunities, and lower perceived wait times. 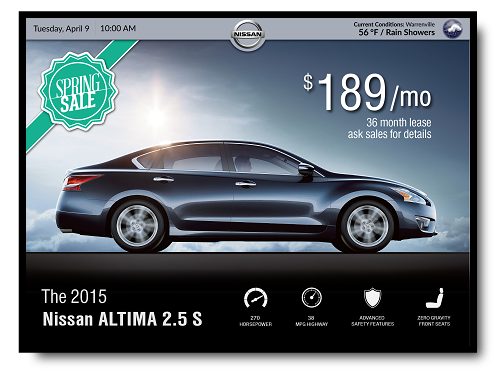 Differentiate your dealership with ITS display solutions. Vibrant, digital content commands attention and drives guest engagement. Unlike traditional paper posters and handouts, our auto dealership displays allow you to make updates in a snap, with no added costs or waiting. Custom-built dealership solutions from Industrial Television Services are designed to serve the unique needs of each client property. Incorporate your own branding, display corporate and site-specific marketing content, and send targeted remarks to visitors with our messaging portal. Generate additional revenue by advertising current promotions and specials, creating extra opportunities for upsell while your prospects are in-house. In your service lounge, keep customers relaxed and informed with real-time status updates on their vehicles as they undergo maintenance. This lowers perceived wait times and reduces the amount of inquiries on vehicle progress, boosting staff efficiency within your service department. We work directly with your property to ensure a turn-key solution that translates into immediate benefits for your dealership. Boost customer satisfaction, increase staff efficiency, and generate additional revenue with ITS dealership display solutions. Our display solutions drive benefits from showroom to service lounge. 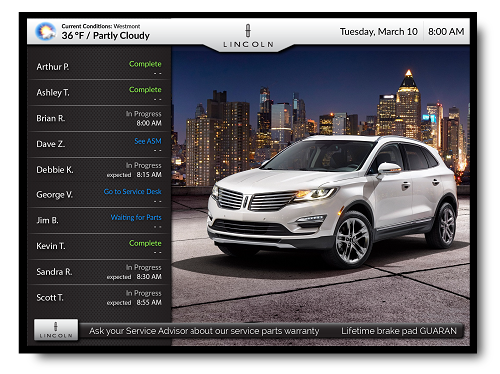 Service Board provides real-time updates on vehicle progress directly to customers. 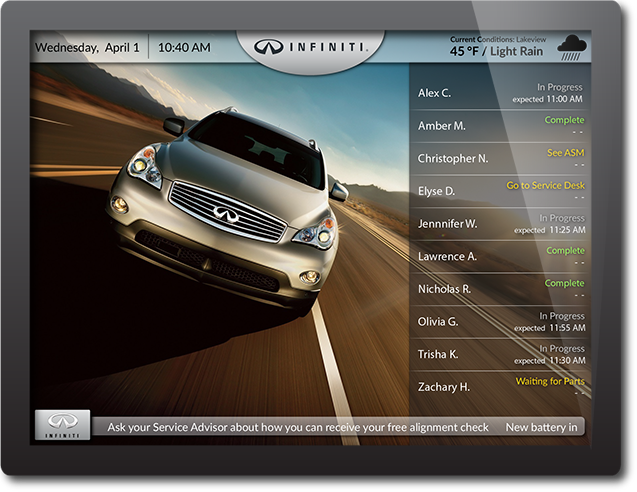 Boost staff efficiency within your service department by reducing inquiries on vehicle progress. Keeping customers informed lowers perceived wait times, resulting in increased satisfaction. Showroom Displays create a whole new dimension to how you engage your audience. Command attention and increase customer knowledge through vibrant, digital content. Generate additional revenue through showcasing current specials while your prospects are in-house.